Dear friends, please join us…. Things are really moving over at 1577. A vibrancy is blossoming; Hope & Thyme comes a little more alive every day. We do still have some challenges ahead in opening as we really envision. The main area we are eager to strengthen is our community’s involvement in bringing our vision to life, by illustrating clarity to the project and welcoming energy to fuel its opening. We have the basic framework ready, and know by giving a voice to an already-existing collective vision, we can speed up the fruition of our energies and give Hope & Thyme its best opening possible. For the past 7 years, there has been an entire community of people with ideas about how this space can be utilized to bring real food to the neighborhood, and we would be doing ourselves a dis-service to not welcome a brainstorming of priorities and perspectives. Our mission is to provide access to, and education about, food and dietary possibilities that support abundance for all stakeholders - the planet; the growers, producers, and distributors; and our employees, neighbors, and patrons. • to promote and honor the integrity of a group of people's words and commitments. The employees that operate Hudson Street Deli and the employees that operate Hope & Thyme are one family. We invite our current employees, as well as those who have expressed interest in future employment, supplier, and networking opportunities, to join us for a special pre-launch open house. 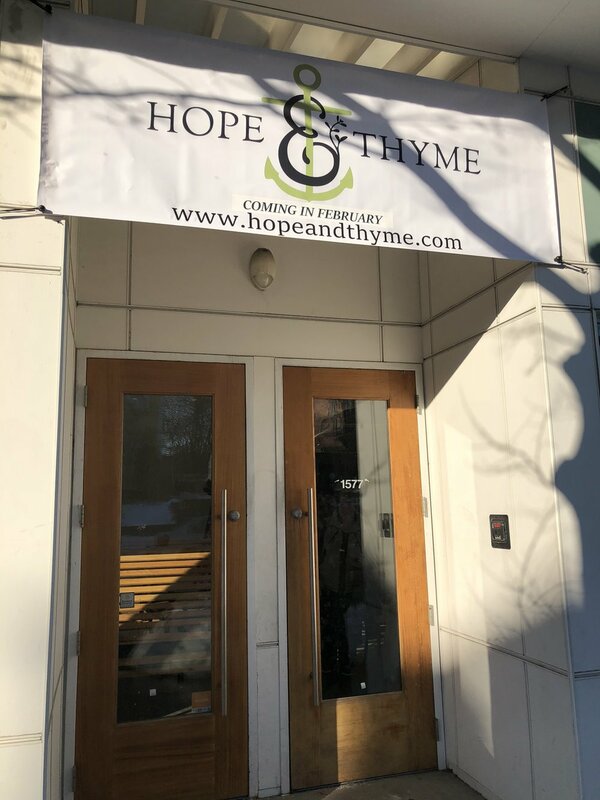 It will be the first gathering of community in the space, and a perfect time to set group intentions for what we want to build in this last moon cycle before Hope & Thyme opens for business. We want you all to see our progress up close and bring your energy into it, to begin manifesting the roles you wish to achieve within the possibility of our two businesses, and beyond into the vision of our community. This project is not complete without including a discussion about the change happening at our first business, Hudson Street Deli. Our first General Assembly on Monday, 1/8/18 marked a shift to the development of a self-actualized, self-directed team. We are seeking to eradicate the social barriers that exist in an employee/employer relationship by agreeing to relate in community instead of hierarchy. Community then challenges us to participate in energy exchanges that are non-traditional, so it feels contradictory to the basic spirit of employment which is “paid work.” It will be our responsibility as the leaders of a self-directed team to follow-through on creating an environment where personal freedom is attainable within a workplace, and an individual's creativity can thrive. We will troubleshoot this process as a team, the owners and employees, over the next several weeks and months, as the transition unfolds. Communication and care from both sides can make it fun and expansive, allowing for more possibility and greater health and wealth. In order for a business to have the room to consider all of these factors of abundance outside of financial status, the employees will agree that some of the value of their energetic exchange with their employer comes from being in a system which takes care of needs in addition to finances. And in order for that to happen, the employees will also make a new agreement to relate to their employers on a human level and accept a path of self-development within community. The community we are striving to create raises its collective wealth by reducing wasteful energy expenditures and relying on others’ strengths to succeed instead of bearing the full burden of all choices and responsibilities as an individual. We challenge you all to take a leap of faith and embark on a journey with us to explore what it means to function as a group of people that organize together to provide a service to a community as a team, with equal respect, humanity, and empowerment for one another, despite there being one business owner employing many workers and purchasing many products. And, the community - our employees, neighbors, customers, and suppliers - choosing to serve each other by making agreements to live healthier and more sustainably, in one place together, conserving energy as a mechanism to promote abundance. Please email us if you can, at info@hopeandthyme.com if you are planning to stop by to share a slice of new moon intention-setting energy. If you are a food provider and would like to send some snacks for the open house, please reach out as well.